Ottawa, Ontario – Elie Boulerice’s overtime winner gave the Ottawa Jr. 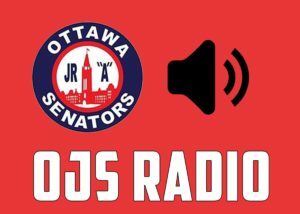 Senators (33-13-3) a 3-2 win over the Carleton Place Canadians (33-11-5) on Wednesday night at the Jim Durrell Sports Complex. Boulerice received Darcy Walsh’s centering pass and threw it into the net for his third overtime winner of the season. The Jr. Senators complete just their fifth comeback win of the season and their first win when trailing after two periods of play. Geoff Dempster tied the game with under two minutes left in the third period. Head Coach Martin Dagenais pulled the goalie with a faceoff in the Canadians zone and Dempster scored on a rebound in front of the net. The Jr. Senators were down 2-0 in the second and completed the comeback. All five of their comeback wins this season have come in the second half. Ottawa Jr. Senators Head Coach Martin Dagenais says that Boulerice got rewarded with the overtime winner because he plays the right way. Ottawa improves to 4-0 in overtime, and 6-3 in extra-time overall. The win also gives them a 3-1 season series lead over the Carleton Place Canadians and improves their franchise record (since 2009-10) to 26-22. Dagenais says that Ottawa’s overtime winner was because Walsh attacked a forward. Francis Boisvert shutout the Canadians in the first (15-saves) and in the third (8-saves), making 39-saves in his 24th win of the season. Boisvert faced 40 plus shots in a game for the first time since October 26th against Brockville (21-starts). “He’s a type of goalie who steps up in big situations. Every time we play a top team, he’s on his game. He’s just a guy who gets the job done and we were outplayed by CP in the first 40 minutes, and he made some miraculous saves to keep us in it,” said Dagenais. The Jr. Senators were outshot for the first time in the second half after the Canadians led the shot count 41-27. Ottawa now improves to 6-6 when being outshot in a contest. The Jr. Senators extend their winning streak to two games while the Canadians have their four game winning streak snapped. Ottawa will face off against Carleton Place for the final team this season on February 18th on the road. Ottawa’s next game is Friday night in Hawkesbury. With a win, the Jr. Senators will pass the Hawks in the CCHL Standings.